DRM protection is often talked by people who purchase or rent the movies from iTunes Store, for iTunes movies can only be given the right to view, but cannot be played on other platform or free share. As a DRM removal software, M4VConverter Plus can help you legally bypass digital copyright protection from DRM protected videos purchased or rented from iTunes Store. So you can enjoy the iTunes movies without authorized account and share them with your friends on different players like Android or any other mobile phones. During converting, 1080pHD iTunes movies with big size will cost more time to remove the DRM protection. High conversion speed is very important to improve the efficient of converting. 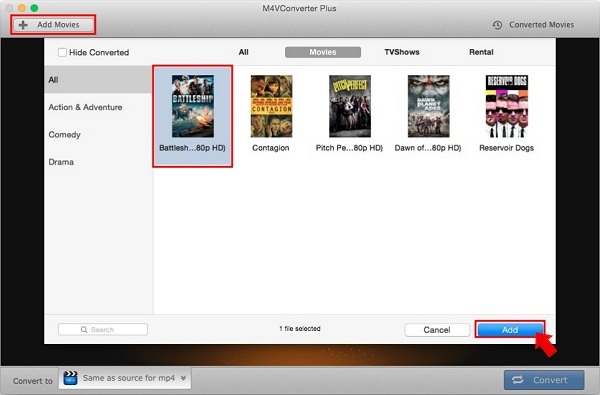 M4VConverter Plus is the one that can convert iTunes movies fast. M4VConverter Plus can remove the DRM protection from the M4V videos, no matter what you purchase or rent from iTunes Store. M4V Converter Plus also provides the corresponding classifications like Movies, TV Shows and Rentals. And movies and TV Shows have been sorted according to the Genres or Show. You can find the files what you want to convert quickly. M4VConverter Plus contains diverse output formats. With the clear classifications, you can set the output format easily and convert M4V videos to video formats including MP4, MOV, FLV, 3GP, 3G2, MKV, etc. You can also extract audio from M4V video as the popular audio formats like MP3, AAC, FLAC, WAV and so on. It is very convenient to choose the output format to convert. With the intuitive interface, you can choose which chapter you want to retain, clip video by setting the beginning and ending time, select to save the audio track from the multiple audio tracks. All of the converting settings are so simple and intuitive. It is so easy to customize the settings. After clicking the Convert button, the converting progress shows up. M4VConverter Plus will start converting the M4V videos with fast converting speed. And with the newly optimized with h264 video hardware compression technology, M4VConverter Plus can even convert 1080pHD with a few minutes.